Othon Palace Fortaleza Hotel, Fortaleza, Brazil details from BrazilBookers.com. The Othon Palace Fortaleza gives a bird’s eye view of the beach located at Av. Beira Mar. This sophisticated area has some of the best restaurants and places to hang out during the night and the Arts and Handicrafts fairs are also quite close to the Hotel. The Othon Palace Fortaleza has 130 rooms and suites, all very well equipped with all the basic amenities, such as air conditioned, safe box, mini bar, phone, hair dryer, clock and dressing table, all very spacious with huge windows overlooking the sea. Other facilities offered by the hotel are the pool, sauna, fitness center, massage room and a solarium. 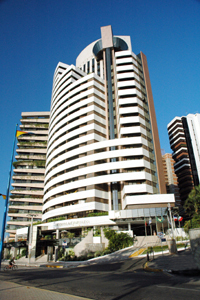 Othon palace, a famous hotel in the city of Fortaleza, Brazil is located in the most sophisticated areas of the city. It is located on the road avenida beira mar and is a short walking distance from the beach. It is surrounded with lots of pubs/bars, handicraft markets and other hot spots which is a retreat for the tourists. The architecture of the 20 storied building is very intricate making it eye-catching. It looks like many steel disks stacked together. The shape of the building is not perfectly cubical but it looks like one tower in the state of mitosis as it goes up. The look is very fresh though. It has 130 rooms and suites. The rooms are well equipped with all the basic amenities. They are fully air conditioned with a safe box with electronic password, a mini bar, a phone, a hair dryer, a clock and a dressing table. They are very spacious with pastel colors used greatly and huge windows overlooking the sea. Every room has a slightly different style but the interior decorator has taken care of making each room look downright lovely. The reception is neat with darker shades of mahogany used for the furniture and marble floor which goes well with the rest of the décor. The pool when seen by the bird view looks like a sector of a circle. The cane furniture lying along the pool goes well with the style. The other luxurious facilities offered by the hotel are a sauna, a fitness center, a massage room and a solarium. The restaurant of the hotel has an extremely snug milieu. The restaurant offers delicious Italian cuisine along with the traditional Brazilian mouth watering dishes. The dim lights of the restaurant with the full armed cane chair offers a very novel look staying earthy at the same time. The décor is smart in the whole of the hotel with sliding doors and marble flooring which indicates recent establishment. The room service is provided round the clock which the hotel boasts about. The staff is very warm, friendly and efficient. They are always ready to serve you with a smile. They ensure that the stay is immensely luxurious and relaxing. The complete comfort provided by the Othon Palace makes it the right place to be in Fortaleza, Brazil. Availability of rooms can be conveniently checked using the internet and bookings be done using the same. When would you like to stay at Othon Palace Fortaleza Hotel ? 1) Rates at the Othon Palace Fortaleza Hotel may not be valid during Carnival, New Years, Easter and other special dates. © Copyright Bookers International, LLC. All Rights Reserved – Information on Othon Palace Fortaleza Hotel, Fortaleza, Brazil details from BrazilBookers.com.